Sometimes I just think funny things: That IS my bag, baby. That IS my bag, baby. (1) Post a picture of whatever bag you are carrying as of late. No, you cannot go up to your closet and pull out that cute little purse you used back before you had kids. I want to know what you carried today (or the last time you left the house). (2) I want to know how much it cost :) And this is not to judge, because I’m honestly telling you I was ready to put down some cash; I just got lucky. This is for entertainment purposes only. So spill it. And if there is a story to go along with how you obtained it, I’d love to hear it. (3) Tag some chicks. And link back to this post so people know why the heck you’re showing everyone your diaper bag/non-diaper bag. This one is a little tricky for me, hence the following blog-fession. See, I lead a double life. When I'm not blogging hilariously about my own personal hijinks, or participating in said hijinks, or drinking, I actually own a small custom-design handbag company. So for the past four years, I've usually been seen carrying one of my own bags. No 'shoeless cobbler's son' for me, beeyotches. I carry my product proudly, and give out business cards along the way. So what does the part-time handbag maker carry when she leaves the sweatshop? Prada? Kate Spade? Coach? Bought at The Maxx, or TJ's, depending on where you live and how much you love the store, and whether you choose to nickname your shopping venues. 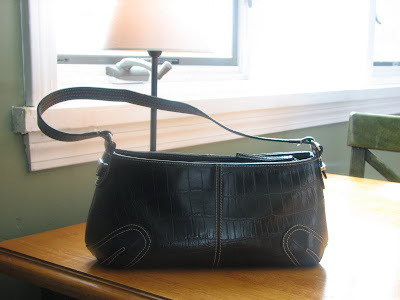 I believe it was somewhere in neighborhood of $8.99, fake croc, and for a little bag holds surprising amounts of stuff. (It does not hold, come to find out, enough Christmas receipts to choke a wallaby, still needing to be sorted through). But that's it. Not glamorous, expensive or large (I have no children in diapers, which is FULLY AWESOME) and is my default color: black. Duh. I love glamorous, expensive, large, non-black bags, I just don't happen to be carrying one today. Ruth: you better be carrying the summer bag I made you since you're in KEY WEST YOU BIZZUTCH. Donna: I'm counting on you--I know how much you love bags. Nat: c'mon, you know you want to...let's see your funbag(s). And now, I feel the need to buy a glamorous, expensive, large, non-black bag.